I know less about Bill Blackbeard than I do any of the other dozen or so men that have had a similarly drastic impact on my life. I know that he was born in Indiana and raised in California. I know that he was in the Army during World War II, and served with honor in the European Theater. I know that the year I was born he established the San Francisco Academy of Comic Art, a non-profit devoted to collecting and organizing newsprint, a practically prophetic endeavor given the coming microfiche and Internet revolutions. I also know that in the 1970s he co-authored The Smithsonian Collection Of Newspaper Comics, and in doing so changed the direction of the art form and the direction of many lives in interaction with it. That includes my own. Like most kids for whom the Smithsonian Collection had a totemic quality, I could go on and on about returning to it multiple times to unearth some new treasure or re-read an old favorite, how it provided the baseline knowledge for just about everything I came to value in one of the great flowerings of the comics art form. Its place in my personal mythology runs so deep that I can still remember the loud snap that came with its removal from a side table's under shelf, a piece of summer furniture with too many coats of paint, its special place of pride in our living room to which the giant paperback would always slightly stick. Its historical significance is undeniable. What old strips have come to prominence and wider appreciation without a section of that lovely book as its initial calling card? What percentage of those working the wonderful and rich side of comics didn't originally whet their appetites lost in its pages? 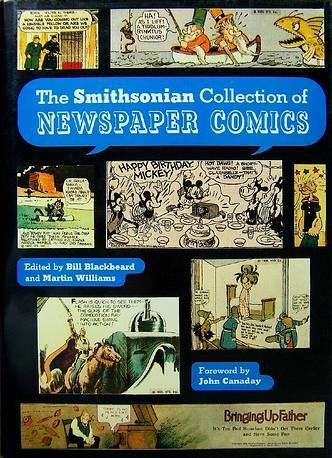 Of course, a wonderful thing about the Smithsonian Collection is that one doesn't have to weave too many words about its stand-alone nature because the book is still there to be read and enjoyed, the Gottfredson and the Crane and the Johnson all within pages of each other, that intoxicating combination of popular art rewarded but never all the way respected. Although it may be the most important work of its kind, the Smithsonian Collection is only one of over 200 books to which Blackbeard has contributed. During my brief time assembling such archival volumes, deep dismay was felt whenever, for whatever reason, a strip book might have to move into production without a Blackbeard suite of originals as its north star. Publishing decisions have for decades now been made or altered according to a single, friendly phone call Blackbeard's way. His is the quarry from which an entire subset of the comics industry has mined. That Blackbeard established his Academy in 1968 means that each of the significant artistic flowerings of the comics art form came in conjunction with important steps taken in his curatorial and advocacy work: the undergrounds, and with it Blackbeard's collection and protection of thousands of pages of print; the 1980s, and some of the eye-popping collections of classic strip work drawn from his holdings; the 2000s, and its elaborate and beautiful book volumes, some with direct contributions by Blackbeard and others featuring those inspired and educated by him. Bill Blackbeard is the embodiment of the impulse to see comics as more than that thing that is right before our eyes, more than that which is here and gone. He is comics' Prester John. So much of what we value and enjoy in comics today and so much of what our grandsons and granddaughters and their progeny will enjoy 100 years from now owes its rescue from oblivion to his hard work and discerning eye. Bill Blackbeard is up for the Eisner Hall Of Fame this year. Voting on-line ends this Friday. There are so many deserving creators in line for this honor, but I hope that if you're voting you'll consider making one of those votes Blackbeard's. If he were to be removed from comics' history, the art form and the industry would look different in ways that are nearly impossible to imagine. He deserves in whatever ways we can provide the spotlight he's given so many others.